Now Booking 2018 Holiday Parties, and 2019 and 2020 Weddings and Events! Call (419) 885-7153, to check availability and schedule yours! my new Infinite Photo Booth where the photo entertainment possibilities are endless! To download, save and print my Kurt's Kustom Keepsakes Original Green Screen Photo Booth Pricing in pdf form, Click Here! Your Official Sponsor of FUN! Looking for a different and fun way to keep your guests entertained at your wedding, Bar or Bat Mitzvah, office party, class reunion, prom, after prom, graduation party, holiday party, retirement party, birthday party, grand opening, fundraiser, or other event? Need a unique party favor for your guests to take home? Photo booths are the latest trend and are becoming more and more popular. This is a great way to engage all of your guests from the very young to the young at heart. How Are We Different From All of the Other Photo Booths In Town? 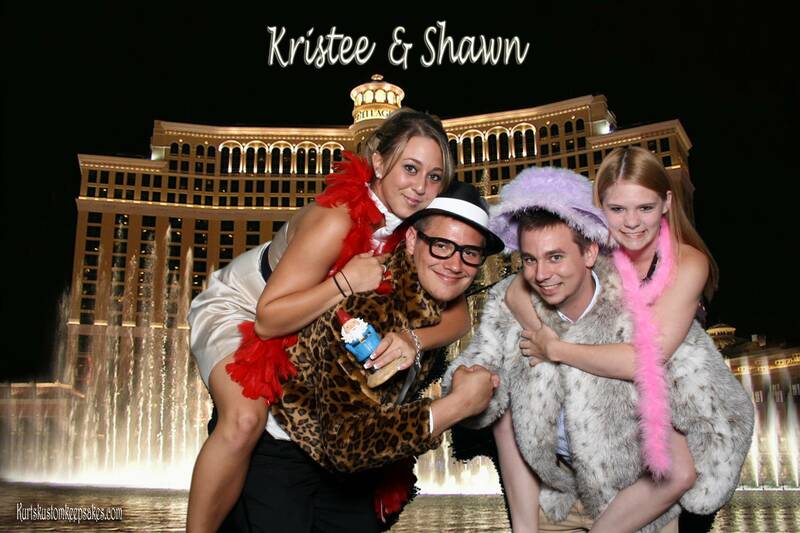 We are the ONLY Photo Booth that gives your guests choices of backgrounds! A couple of weeks before your event, I will ask you to come into my studio to choose the backgrounds you want your guests to use at your party. You can choose from the hundreds of backgrounds I have, or I can create backgrounds specifically for you. If you have a theme for your event, have a favorite destination, or specific colors you want used, I can match the background to your needs. If this is for a fundraiser or for your business, I can even have your sponsors or your logo for the background. At your event, your guests will have their pictures taken in front of the green screen and can choose their background from the images you previously selected. Then with a little "Hollywood" style computer magic, your guests are transformed into the background image making a one of a kind picture. I can also add the date and wording to your photos, customizing each image for your event, at no extra charge! Unlimited prints means UNLIMITED PRINTS! Many photo booths say that they have unlimited prints. 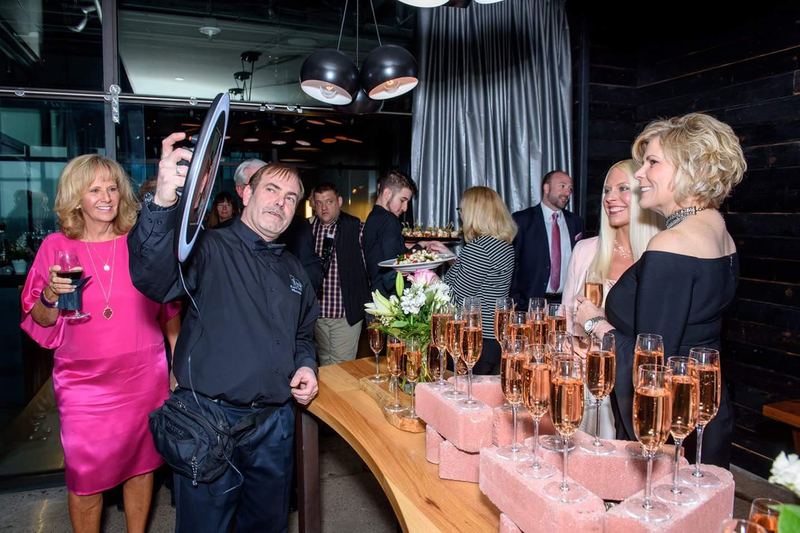 What they really mean is that your guests can take as many pictures as they like, and they will print out 2 strips every time they get in the booth. We print a full 4x6" photo for Everyone in Every Photo Every Time! We use a 10 foot by 10 foot green screen! Most people have seen the traditional or "retro" style photo booths which only hold two or, at best, three people in an actual box-like booth. My photo booths are an "open-air" type of booth which is a ten foot wide screen which can fit 10-15 people comfortably. People love that idea for the fun group photos they would not be able to have with a traditional photo booth. It's also a great way for your guests to interact with each other. Because all of my photo booths are open-air, they are also completely handicap accessible! We don't Automate! Unless, of course, you want us to! Every photo is manually created on demand, which in turn means that we always interact with your guests and make sure they have fun! There will be a photographer and a computer technician at all events. Unlike other photo booths that are stationary, having a photographer actually take the pictures ensures that everyone will be in every picture. You won't have only the tops of the heads of little ones and the taller people will not be headless! Having a photographer present means we can adjust the camera to you, not make you have to adjust to the camera and hope for the best. All images are uploaded to an online gallery within a few days of the event to my Kurt's Kustom Keepsakes website for you and your guests to download for FREE. We create a separate gallery for every event and each gallery stays on my website permanently. We don't take them down after a month like other photo booths. You will also receive a CD or USB drive of all of the photo booth photos. We will bring our big box of premium props (depending on your package), or you can supply your own, which adds to the fun and excitement of the event. Everyone loves to play dress-up and we bring enough so that everyone can have fun! We are a completely Portable Portrait Studio with Instant On-site Printing! If you are looking for formal or prom style photos that are printed on site, we have you covered. We can use our same photo booth set up with a studio backdrop, or your set, for instant prints at any event. Call me at (419) 885-7153, for details and a quote! Instant Sharing Available! Depending on your venue (some venue's walls don't permit WiFi, or their WiFi may have strong firewalls that block our signal), we can instantly upload the photo booth images for your guests to immediately share on their favorite social media sites, at no extra charge to you! Because of the size of the green screen and the equipment we have with us, we ask that you provide us with a space that is at least 11 x 14 feet and a 6 or 8 foot table for our equipment and a second one for the props. We also require and a chair for the computer person to use. If we are making a scrapbook, we will need another table for all of the supplies and so your guests have room to write their messages to you on the scrapbook pages. We will also have a third person to pass out the prints and keep the "traffic" flowing. We will arrive a minimum of one hour before your event to set up so we are ready to go when your first guest arrives. To learn more about my Kurt's Kustom Keepsakes green screen photo booth, Click Here! 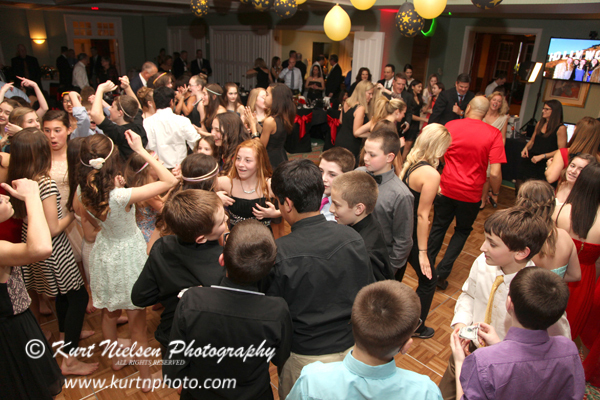 Just The Party Package is a great package for Bar or Bat Mitzvahs, Corporate Events, Holiday Parties or other special events where you want a photo booth and need a photographer. 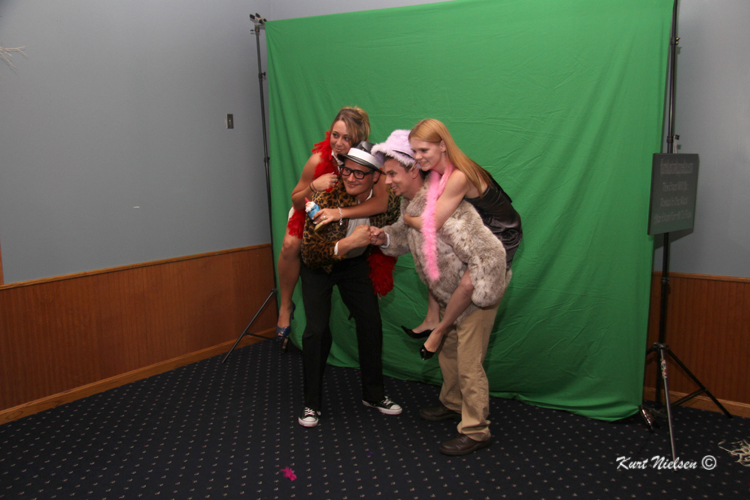 Kurt will photograph the highlights of your event and you get the photo booth for the duration of your event with unlimited 4x6 prints for your guests to take home. You also get a disk or USB drive of all of the images that Kurt takes of your event and the images from the photo booth with a copyright release. The Complete Wedding Package is Kurt's Full Wedding Coverage Package with the Kurt's Kustom Keepsakes package and the addition of the Scrapbook. This is a great value! You get full photographic coverage of your wedding day, up to 12 hours; the photo booth for the duration of your wedding reception, up to 5 hours, with unlimited 4x6 photos for your guests to take home. We also print up to 200 photo booth photos of your guests and attach them to scrapbook paper. Your guests then have the opportunity to decorate and sign the pages creating a fun and unique photo guest book for you to take home that night. Please see my Wedding Pricing for all of the details on this and all of my wedding packages! Introducing the New Kids In Town! I am always trying to stay ahead of the curve and think outside of the box in my photography business. The same goes for my photo booth business! That's why I am introducing Toledo to some of the newest crazes in the Photo Booth Industry! Be prepared to WOW your party guests! 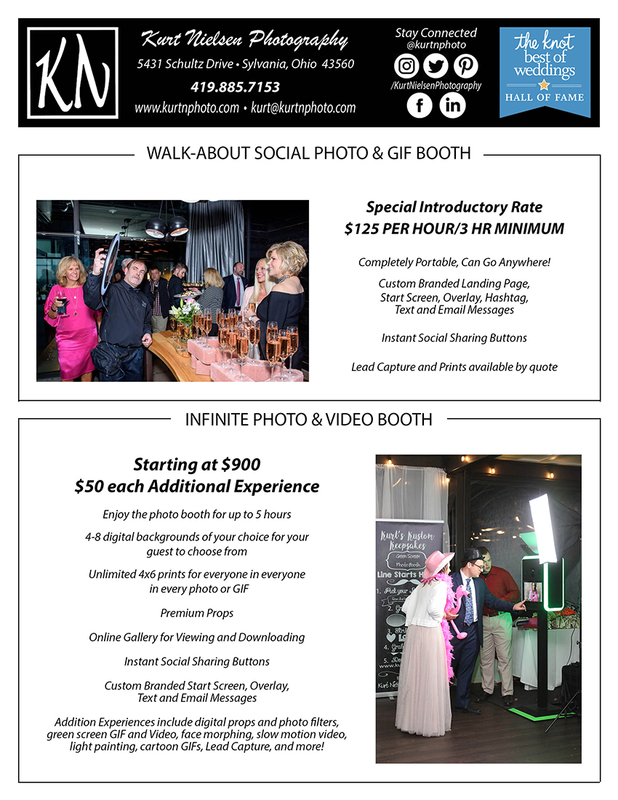 To download, save and print my Walk-About Social Booth and Infinite Photo and GIF Booth Pricing in pdf form, Click Here! Don't have room for a photo booth? Don't think your guests would utilize a photo booth that's placed away from the action? Then let us take the photo station to them! The stylish design and attractive lighting will catch their eye from across the room and make your guest extremely curious. It's like nothing they have ever seen in Toledo! Once they know it's a portable photo booth, they will be ready for their close-ups and want to be the next one to experience the fun! This roaming photo booth is a revolutionary new concept in photo entertainment! It is totally portable and can literally go anywhere! Well, except in the bathroom. I refuse to take it in there! I can take it to your guests' tables, out on the dance floor, backstage, on stage, into the crowd, on the party bus, in the stands of the stadium or arena, even from room to room. I can go anywhere that your guests may be hanging out. But wait, there's more! As soon as I take the picture, your guests can send it to themselves via text or email and receive it within seconds! Then they can immediately share it on their favorite social media websites! Also, as with my other photo booths, my walk-about booth is completely customizable for your event or brand. We can customize the start up screen, the layout screen, the gallery screen, and the text and email messages with your information and logos. We can even add your own personal or event hashtag to the images! All of this is included in the Introductory Price of $125 per hour with a 3 hour minimum per event! But wait, there's still more! Upgrade the fun by adding a print option so your guests can take home a 4x6 print! Display the fun in a slideshow of all of the images on a large screen LED TV! Lead capture is also available for an additional fee. Call me at 419 885 7153 for a quote and to check my availability! My Walk-About Social Booth can also be mounted on a tripod and transformed into a stationary photo station that can be placed anywhere! When it is mounted, the selfie booth can also create animated GIFs! A GIF is a series of photos, usually 3, that are taken and then stitched together to make a video like the one you see of me with the camel. This is just another way to add fun to your party. Your guests can even choose between having a photo or a GIF. They can even add filters to their photo or GIF. Since it is the same as my roaming Walk-About booth, your guests will be able to immediately send the images to thier phone for social sharing. When the GIF booth is stationary, you can also choose one of my new pillow stand backgrounds. I have 10 different designs to choose from. You can even choose to do the photos or GIFs using Green Screen! However, this green screen booth can only use one background per event. And just as with the Walk-About Booth, the GIF booth is completely customizable and brandable, and can print 4x6 photos! The pricing for my GIF booth is the same pricing as the Walk-About Booth. 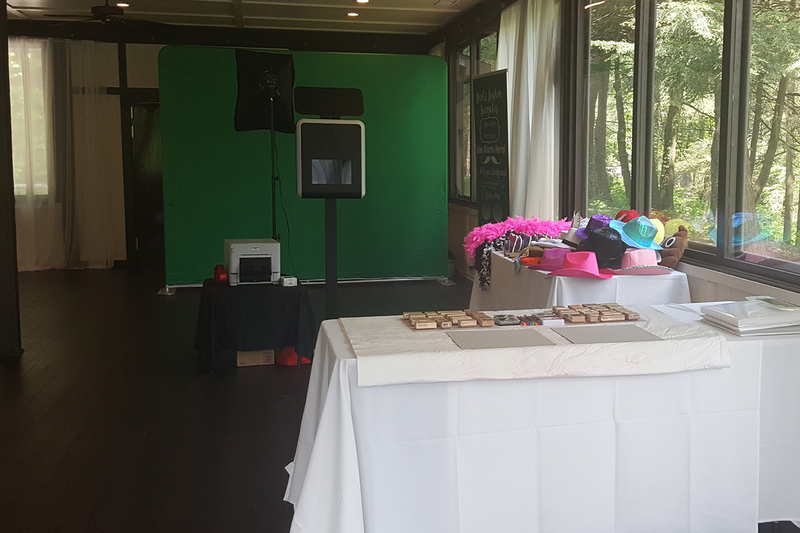 My Walk-About and GIF booths are the perfect addition to your party or event and are budget friendly! For the Ultimate Party Experience! This photo booth comes with 3 separate cameras and has unlimited activations including green screen photo and video booths, photo and video filters, digital props, face morphing, slo motion video, animated GIFs, light painting, immediate social media sharing, and more. The front screen is for live viewing so you can see yourself in the image or video as it is taken. The back screen is for social media sharing, printing and viewing the slideshow of all images taken! 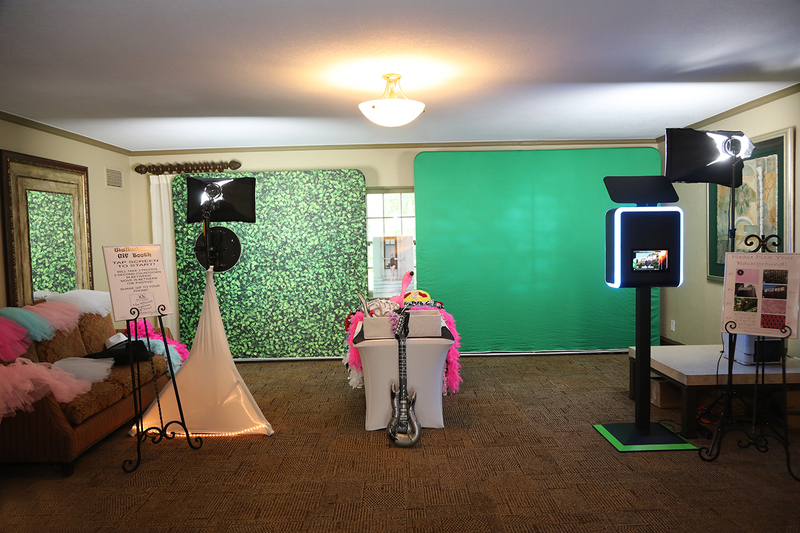 My Infinite Photo and Video Booth is completely customizable and brandable including the lighting! Lead capture is also available. Base price starts at $900 for use as a green screen photo booth. Each additional activation is $50. Call 419 885 7153 for complete pricing details for your event. See my Walk-About Social Booth and my Infinite Photo Booth in Action! Upgrade your photo booth experience by adding photo folders to the prints. This is a great way to keep your guests photos safe from bending or tearing. Adding a scrapbook to your event allows your guests to provide you with a one of a kind guest book for you to take home. We supply the scrapbook, paper, pens, glue, ink pads and stamps. We will print the photos your guests take and they get to sign and decorate the pages specially for you! Your guests will love this option! Kurt's Kustom Keepsakes Green Screen Photo Booth is available with or separately from Kurt Nielsen Photography. 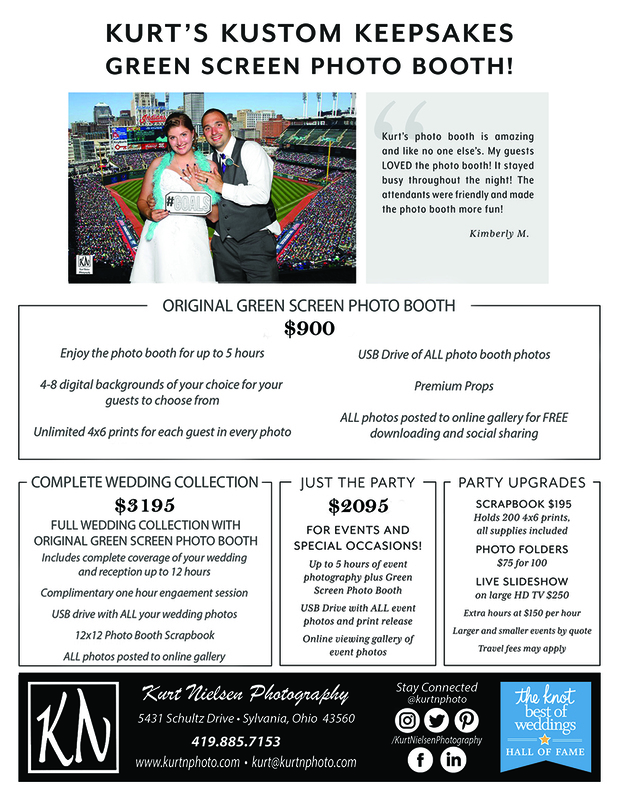 To check for availability or to schedule your FREE photo booth consultation, please call Kurt at (419) 885-7153,. Other photo booth options available by quote. Although we are based in the Greater Toledo Area, Kurt's Kustom Keepsakes Green Screen Photo Booth is available for anywhere in the world! Travel fees may apply. Ask Kurt about special pricing for non-profit organizations and fundraisers. Live Video Slideshow using a Extra Large HD TV! Our new Extra Large HD TV with a Real Time live photo booth feed sits up high enough for all of your guests to watch (depending on placement in venue). As soon as the photo booth photo is created, it is placed directly into the slideshow, creating more entertainment for all of your guests. Your guests will be able to see themselves on the big screen no matter where they are in the room (depending on venue), and so will everyone else. 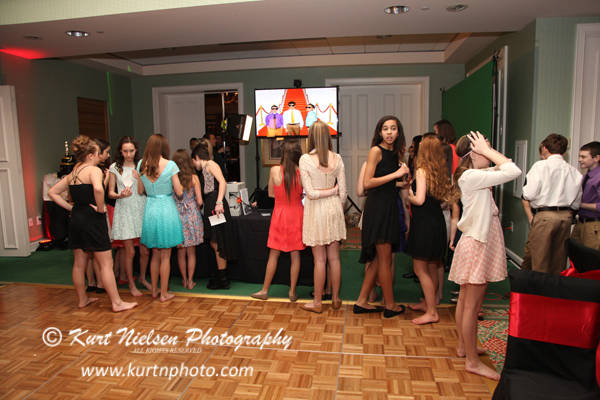 Being able to see what is going on from anywhere in the room adds to the fun and excitement of our green screen photo booth, and to your event! This is an add-on feature due to the added equipment, transportation and personnel involved. and find out what other brides are saying about Kurt's Kustom Keepsakes!